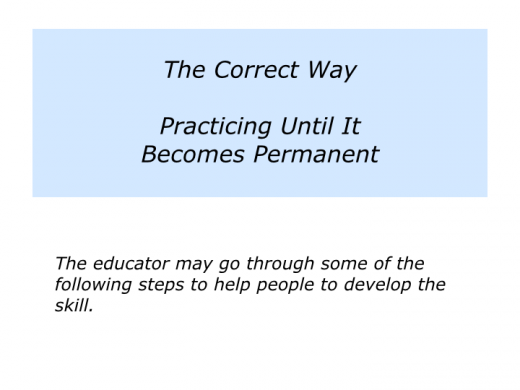 There are many ways to help people to develop a skill. This article looks at the classical way of helping them to learn correct practice. The approach is sometimes used by classically trained teachers in a particular field. Like any method, it has both pluses and minuses. 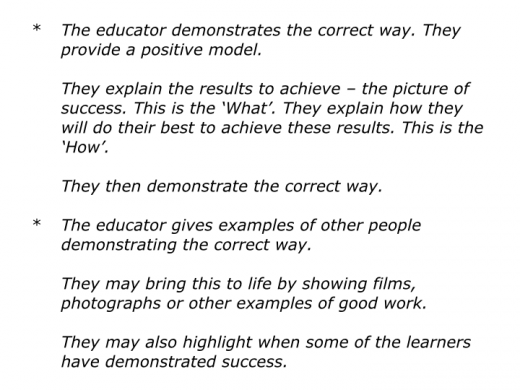 The approach may seem rather formal, but the aim is to provide the learners with an established framework that works. Then, after mastering the skill, they can add their own variations. There are obviously some geniuses that make their own rules and achieve success. But even they may incorporate some of the classical approaches from their chosen field – be it in cooking, music, sport, coaching or whatever. 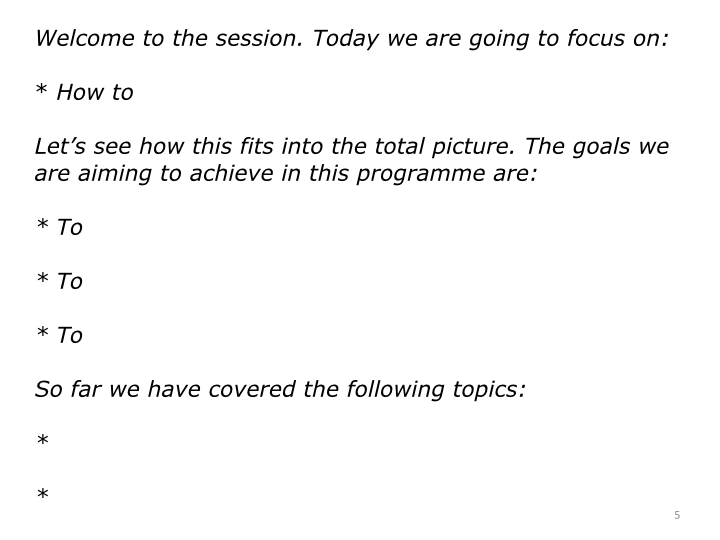 The specific goals to achieve in the class, workshop, coaching session or other kind of learning programme. 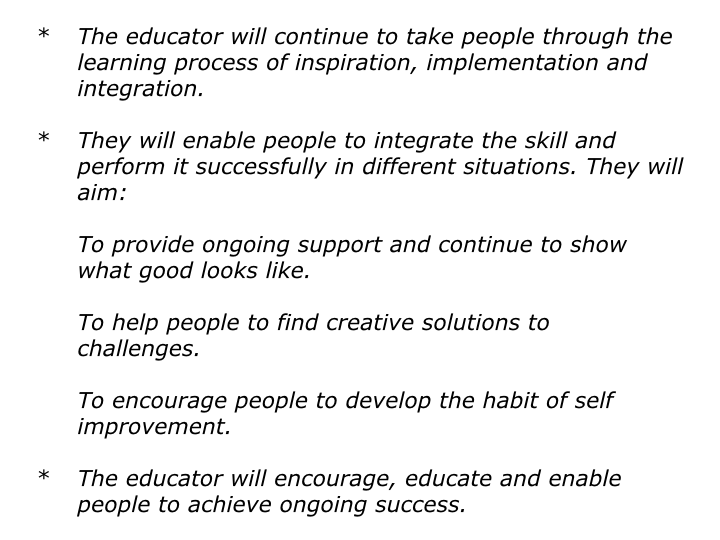 The teacher’s responsibilities in helping the learners to achieve these goals. 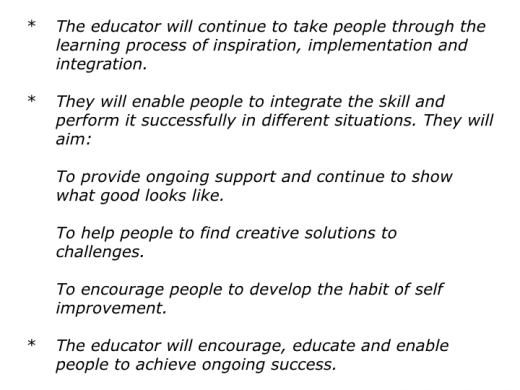 The learner’s responsibilities in working towards achieving these goals. 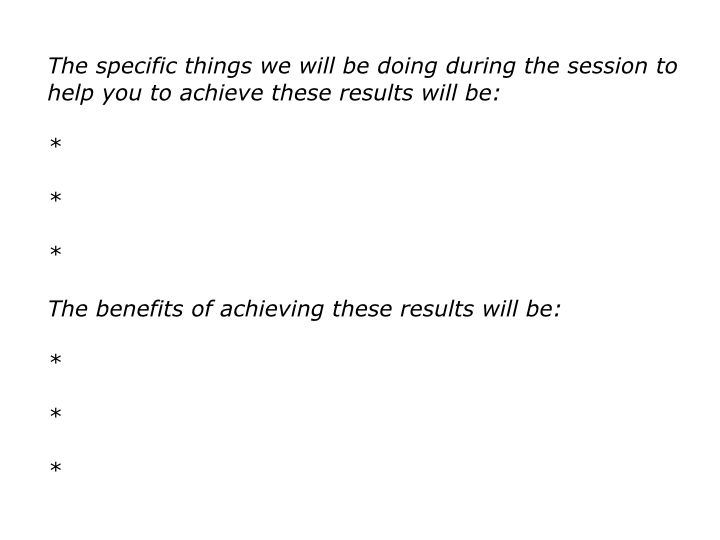 The specific things that will be happening that will show the learners have achieved the goals successfully. 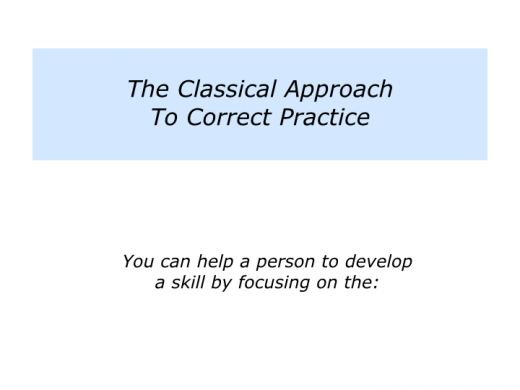 Let’s explore how you can follow the classic approach to helping people to learn a particular skill. 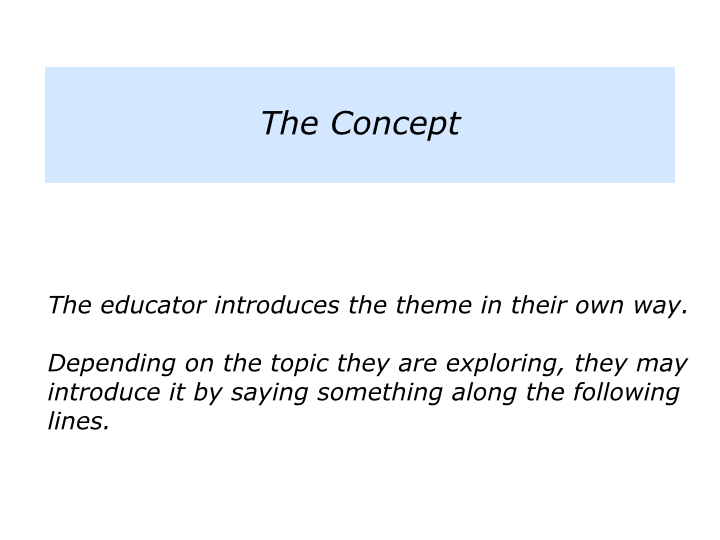 Educators often start by explaining the concept, the context and the desired concrete results. 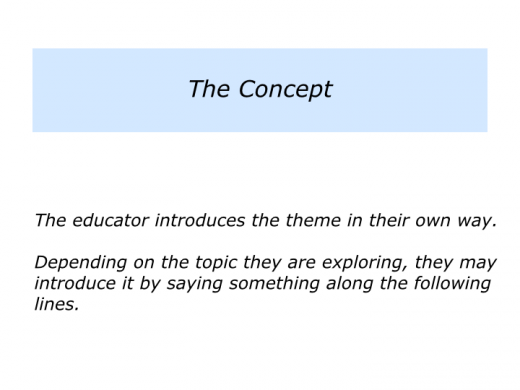 They also bring the theme to life by giving examples from the particular field. This enables people to see how the skill fits into the big picture. Imagine that you are helping people to develop a particular skill. 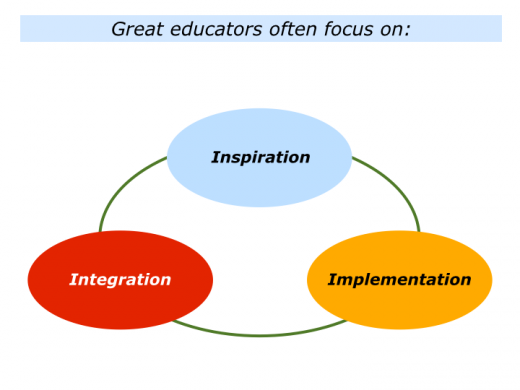 You may go through some of the follow steps that are taken by educators. Let’s assume you have given this kind of introduction. It is time to move on to the next step. 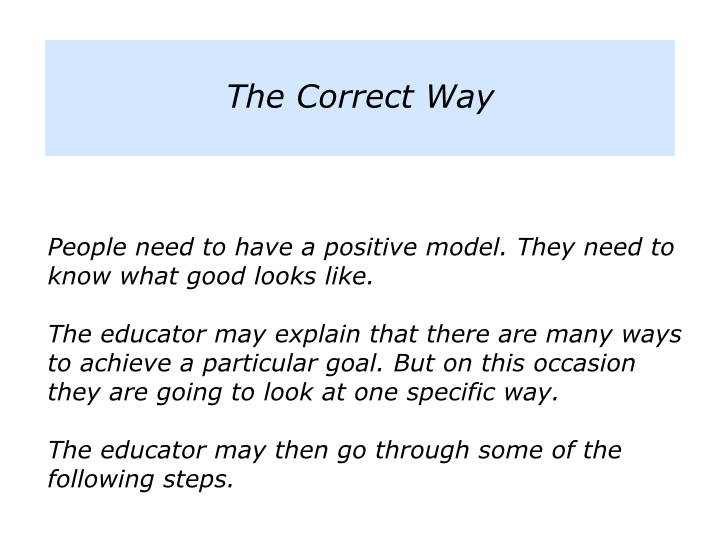 Educators provide the people with a positive model. People need to know what good looks like. They need to see a picture of success. Imagine you are helping people to learn a particular skill. You may go through some of the following steps in your own way. 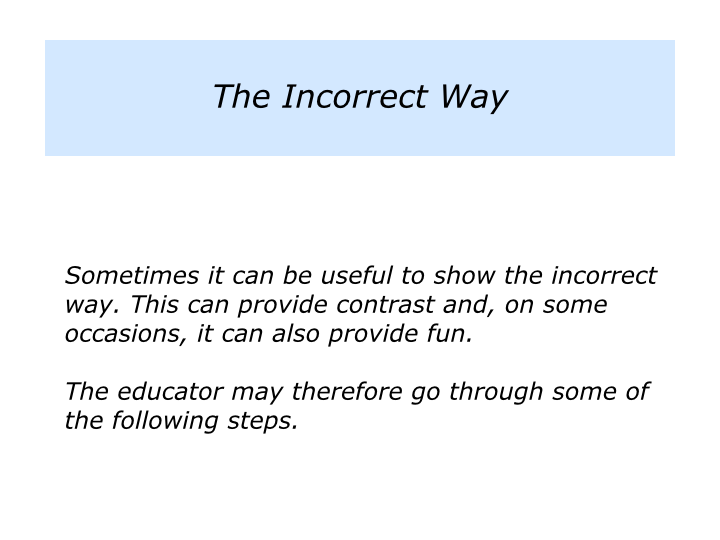 Educators sometimes also show the incorrect way. Why? 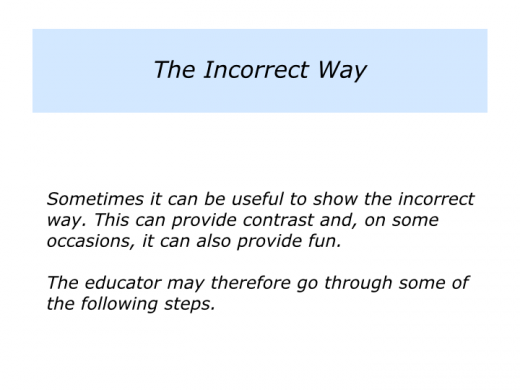 This can provide contrast and, in when appropriate, can add fun to the session. 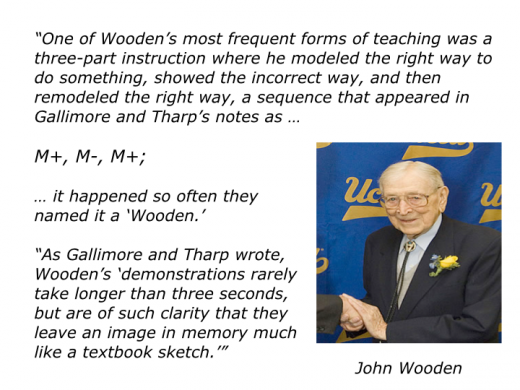 John Wooden, the legendary basketball coach, took this route. Writing in The Talent Code, Daniel Coyle explained how two researchers described Wooden’s methods. “He taught in chunks, using what he called the ‘whole-part method’ – he would teach players an entire move, then break it down to work on its elemental actions. 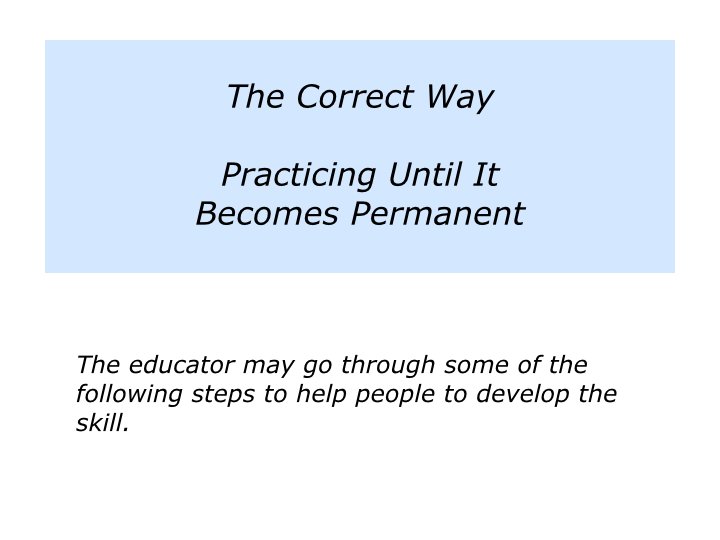 Educators help people to develop the particular skill until it becomes permanent. How to make this happen? The key is to see people in action or see a piece of their finished work. If you are a golf coach, you want to see the player hit golf balls. If you are a musical coach, you want to hear the performer playing their instrument. 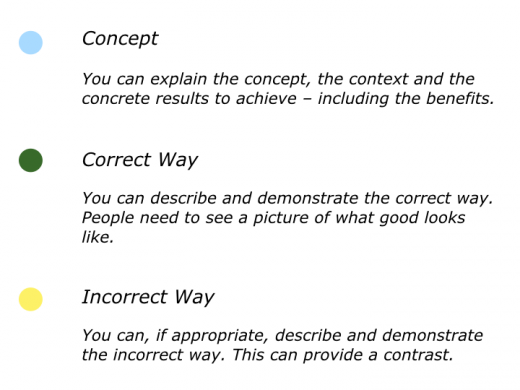 If you are a writing coach, you want to see an example of the person’s writing. Why? This provides a reality check. It is the only way you can judge somebody’s performance. The same rule applies to any form of coaching. Some people talk a great game, but seeing them in action can be an eye opener. The person must be given the chance to reflect. They need to do some self evaluation and clarify what they have learned from the experience. So you may say something like the following to them. “Take a few minutes to reflect. 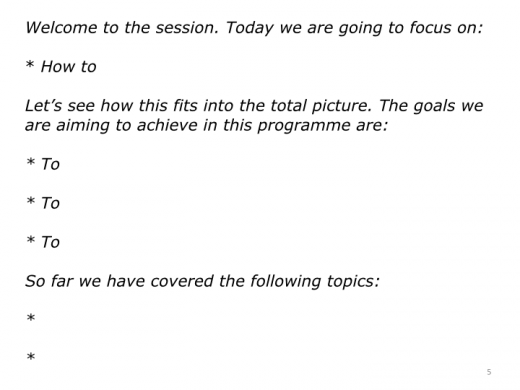 Certainly I have some ideas about how you can build on your strengths and focus on areas for improvement. “Try to be as specific as possible. After doing this, I will ask you to share your ideas. Then, if you wish, I will add some ideas of my own. 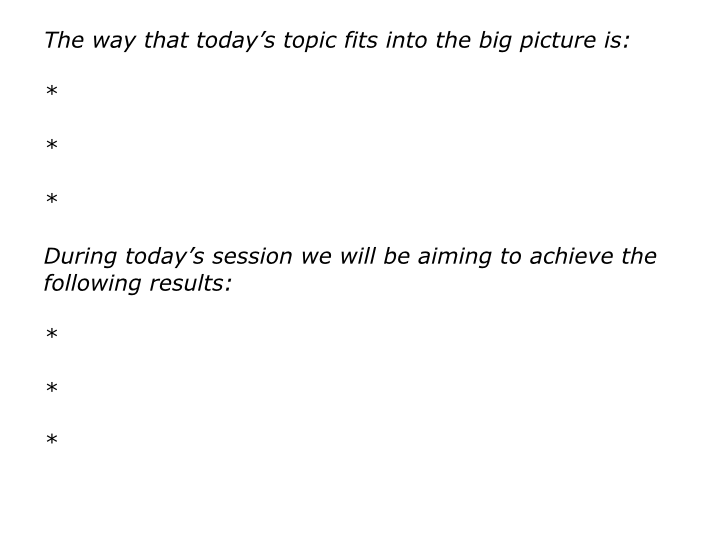 Building on what the person says, you can then help them to develop their strengths and tackle areas for improvement. If appropriate, you can demonstrate the skill again. You can also share your knowledge by providing positive models and practical tools they can use to add to their repertoire. The person can then keep working until they achieve the picture of success. 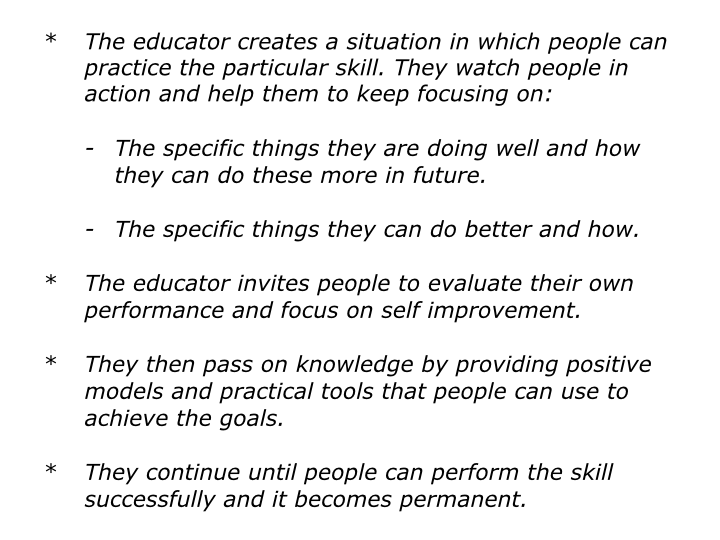 Imagine you are helping people to develop a particular skill. 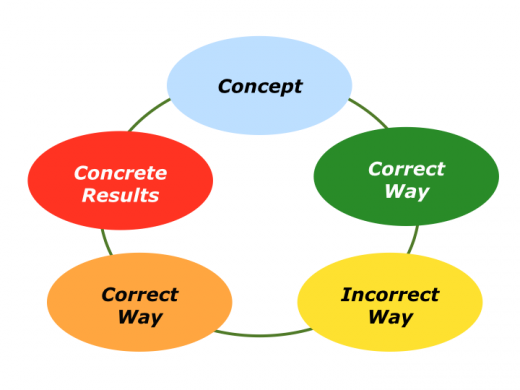 You may go through some of the following steps to help them to develop it successfully. Educators often help people to learn by focusing on the 3 Is: inspiration, implementation and integration. They create an inspiring environment. 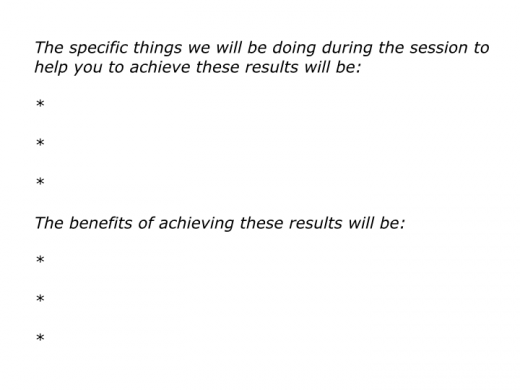 They provide implementation tools that work. 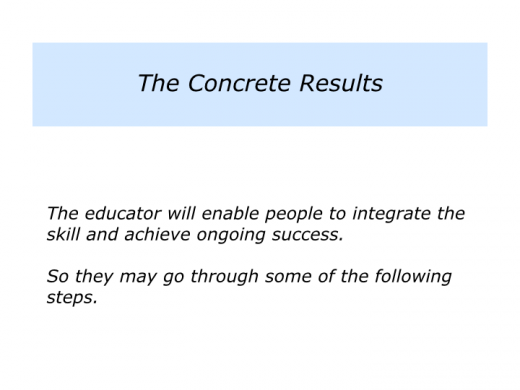 They help people to integrate the learning into their lives and work. The dance step in the way it should be performed. The dinner dish in the way it should cooked and served. The musical piece in the way it should be played. 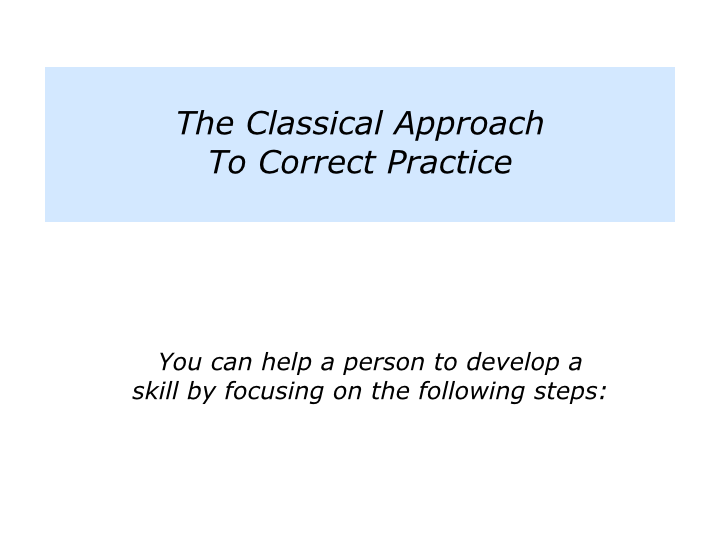 To replicate the classical approach. To replicate the classical approach and then add their own variation. To replicate the principles embodied in the classical approach, but express these in their own way. To simply go their own way. 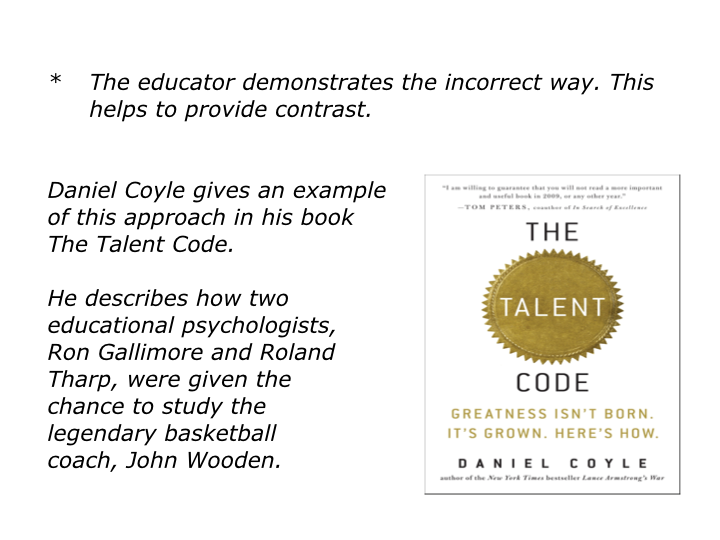 Educators recognise that it is vital for people to be true to themselves and their talent. 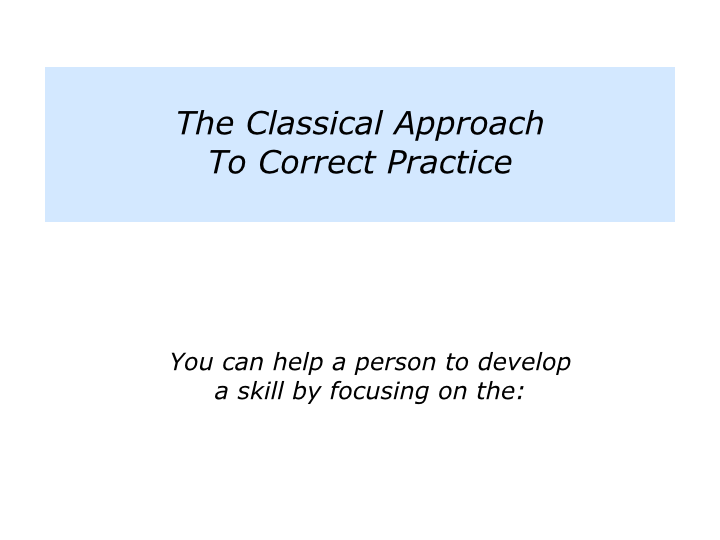 Those teaching the classical method, however, make the deal clear to their students. People are there to learn the correct way. 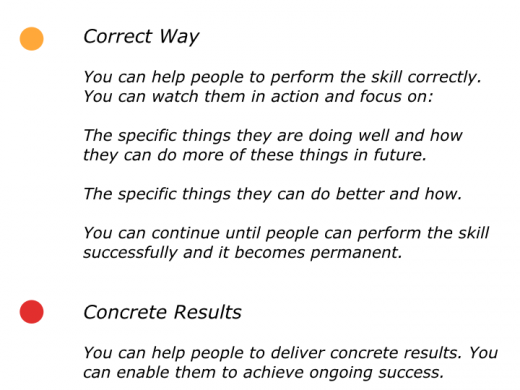 They must first master the basics and perform these successfully in many different situations. They can then add the brilliance. 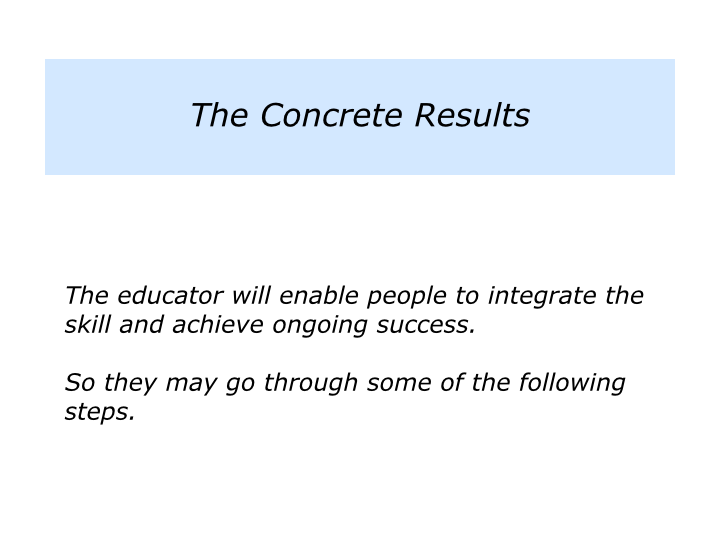 Educators do whatever they can to help people to deliver concrete results. They then urge them to develop the habit of self improvement. They aim to encourage, educate and enable people to achieve ongoing success. 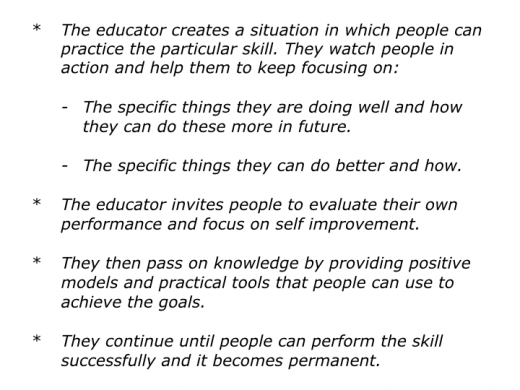 Imagine you are helping people to develop a particular skill. You may go through some of the following steps to help them to achieve concrete results. 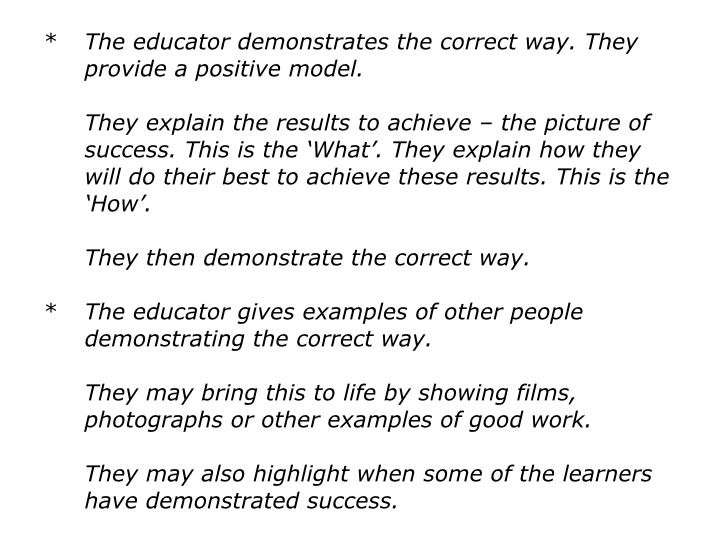 There are many approaches to education. 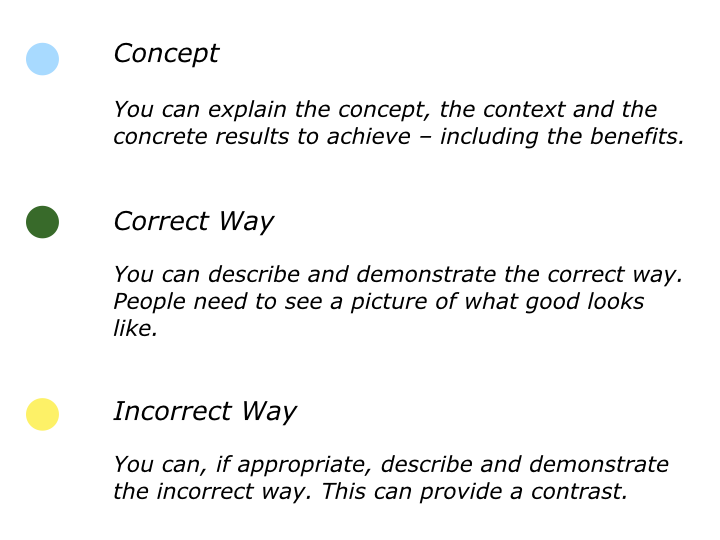 Here we have been looking at the classical approach. 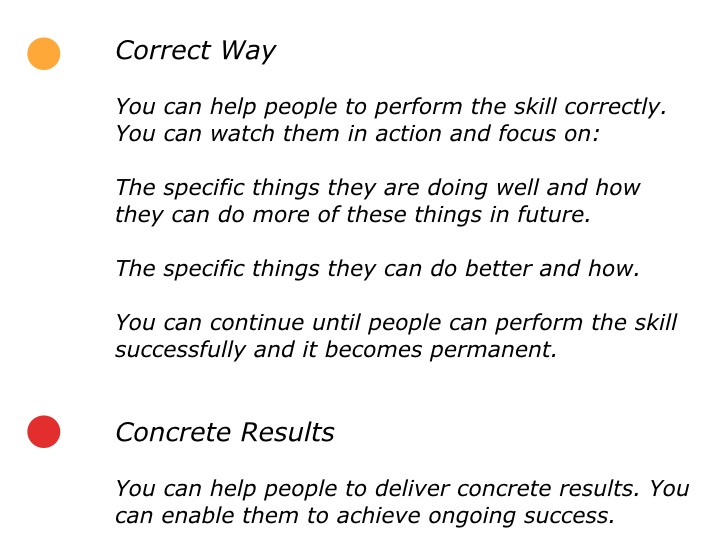 This involves going through the following steps towards helping people to perform a skill successfully.